Last night was the first night I forgot to post my 366 project photo! It must have been the king’s cake since I certainly didn’t get a hurricane this year. This is the third year I’ve purchased a cake for Mardi Gras and so now it’s officially considered a tradition, I think the kids decided that last year actually. Their dad hides the little baby and the person that finds the baby gets to choose the cake next year. It’s all very exciting for them. 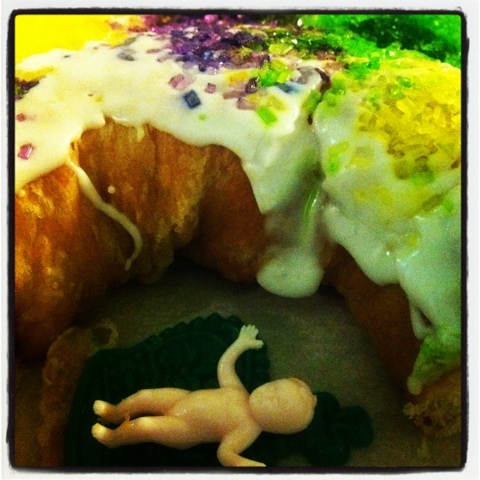 This entry was posted in Instagram, Project 366 and tagged baby, cake, Instagram, Kings cake, mardi gras, project 366. Bookmark the permalink.